1. Put the rice in a bowl, pour water and mix quickly for a fast wash, then immediately throw away the cloudy water. Please be especially careful because if you do not throw away the cloudy water immediately, your rice will not cook as tasty as it should. Wash the rice 20 to 30 times pushing it back with the palm of your hand. 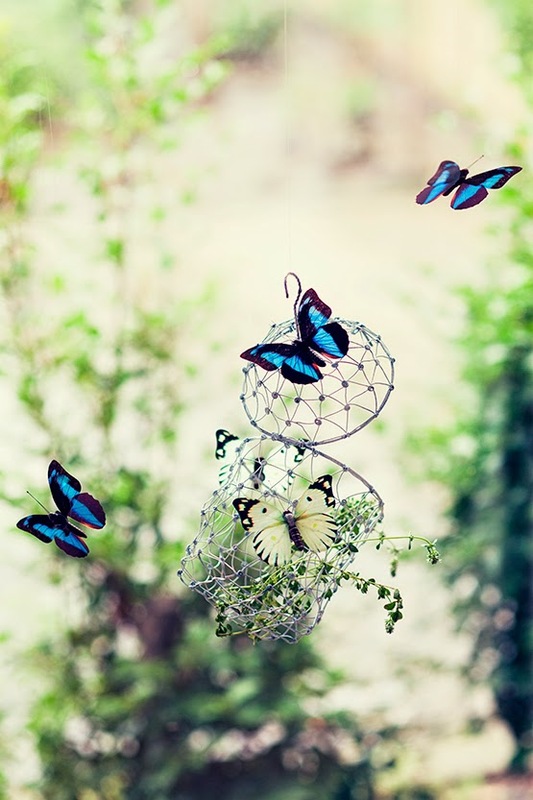 Throw away the cloudy water and add new water. Repeat 3 or 4 times until the water does not become cloudy anymore. Place the rice in a sieve and let it sit for 30 minutes in the summer, or 60 minutes in the winter. If you cook the rice right after washing it, it will not become fluffy. 2.Drain the water off the rice and place it in a small pot. Add as much water as rice and a little bit of food coloring to make it pink. Cover with a lid and cook over a strong fire. Once it boils, stir and then cover again. Lower the flame and cook for 10 more minutes. Turn the fire off and let steam for 10 minutes. ※The rice is not usually stirred while cooking it in the pot. However, in this recipe, since the amount of rice is rather small, stirring it helps to avoid the rice becoming hard. 3.Make the pork soboro (seasoned ground meat.) Put the ingredients marked with a ★ (star) symbol in a small pot, mix well and cook on a strong fire. Use a wooden spatula to keep stirring it while cooking until the juices evaporate and stop the fire. 4.Once the rice is ready, open the lid, wet a spatula with water and use it to lightly mix the rice, bringing it up from the bottom of the pot. If you smash the grains of rice, it will not taste as good, so be careful. 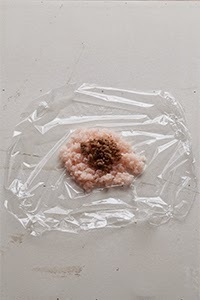 Divide the warm rice in 5 parts and wrap each of them in plastic wrap. 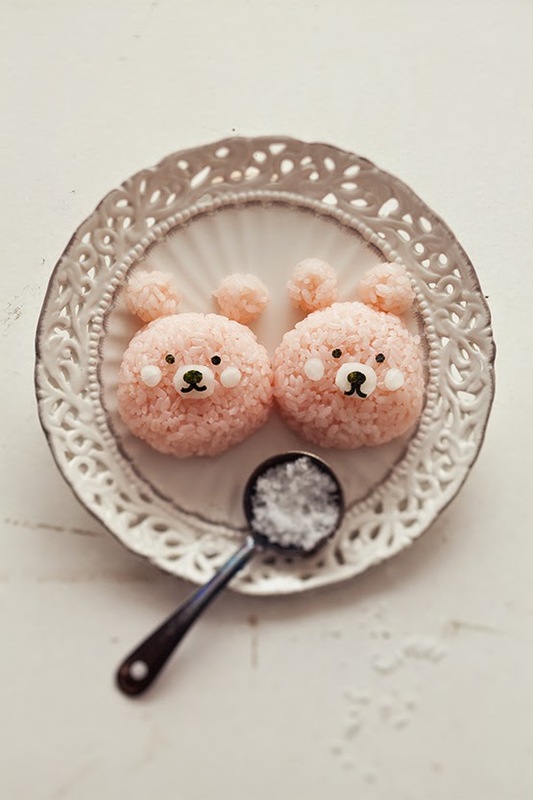 5.Make two very small rice balls using the rice that you set apart first. These will be the ears of the bear. Each of these small rice balls should be about 5 grams(about 0,2oz). Wrap the rest of the rice in plastic wrap, and place 1 tablespoon of seasoned ground meat on top. Make a ball with the rice so the meat will be at the center. 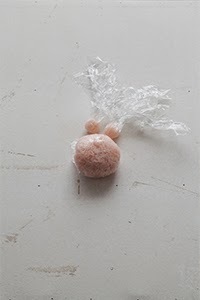 Take the plastic wrap off, wet your hands slightly and sprinkle some salt on the rice ball. 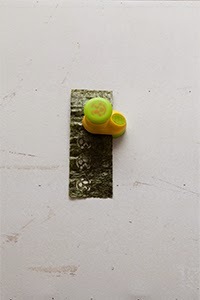 6.Make the face of the bear by cutting small pieces of seaweed. For the white part of the face, I put some salt on radish and cut it in small pieces. Leave some seasoned ground meat after you make the rice balls. You can use this meat to eat it with warm rice, and it is also yummy wrapped in vegetables such as lettuce. Original recipe makes 20 very small pancakes. ①Beaten egg to room temperature and put it in a bowl. Add the sugar and mix well with a whisk. Add the milk and melted butter , mix well. Add the cake flour and baking powder, mix until smooth. ②Heat a lightly oiled griddle or frying pan over medium high heat. 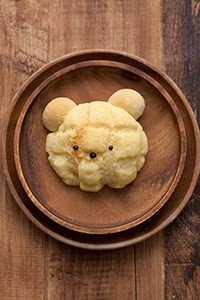 Put the dough in a pastry bag and squeeze out the frying pan( shape bear). Bake for until they become golden brown. 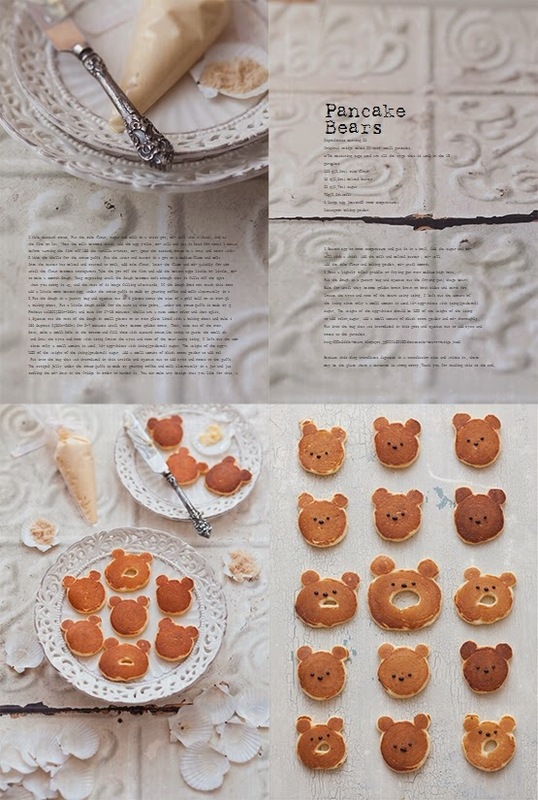 Create the eyes and nose of the bears using icing.I left out the amount of the icing since only a small amount is used.Mix egg-whites with icing(powdered) sugar. The weight of the egg-whites should be 15% of the weight of the icing(powdered) sugar. Add a small amount of black cocoa powder to add color,and mix thoroughly. 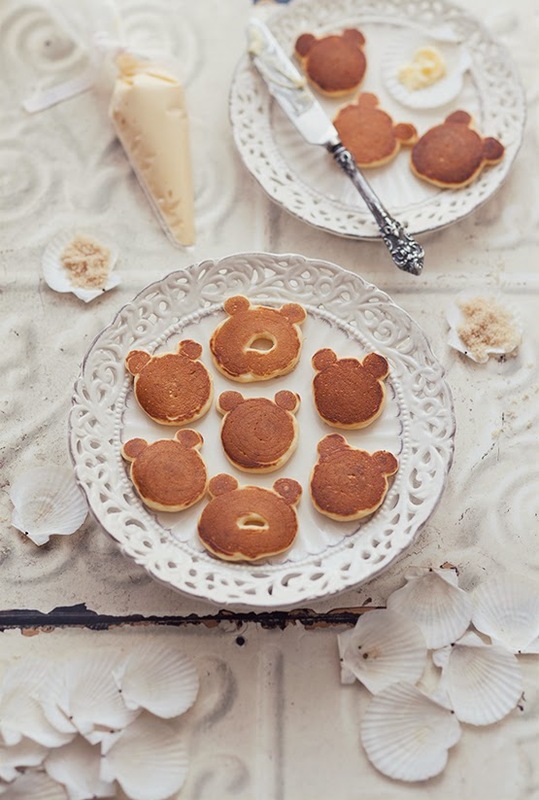 Put into the bag that was introduced in this posthttp://edible-bears.blogspot.jp/2014/03/cheesecake-bears-recipe.html and squeeze out to add eyes and noses to the pancakes. ① Make the cookie dough. Put butter into a bowl and mix it thoroughly with a whisk, making it smooth. Add sugar and mix together thoroughly. Once the color of the eggs turns white, add the beaten eggs in 2 or 3 times and mix well. Add a few drops of melon oil and mix. Change your whisk for a spatula, add flour and baking powder to the bowl and mix until no lumps remain. Divide the cookie dough in 10 pieces, wrap each of them in plastic wrap, and keep in the refrigerator until immediately before use. ② Make the bread dough. Get two bowls ready, and put bread flour and salt in one. Put the water(use lukewarm water during wintertime), sugar,milk, and dry yeast into the other bowl and mix together thoroughly. 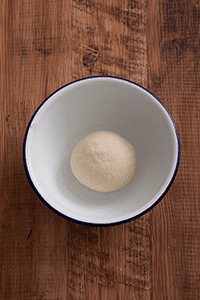 Add this mixture into the bowl containing the bread flour, and knead. When the surface becomes smooth, add butter and knead thoroughly once more. Then, roll the dough into a ball and put into a bowl. 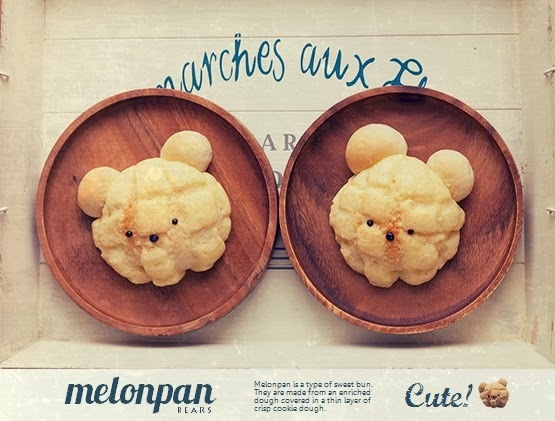 - 20 pieces of dough of 5grams(about 0,2oz) each, for the ears(Make 20 small dough balls). 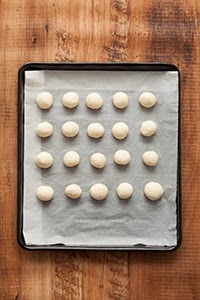 - 10 pieces of dough of about 26grams(about 0,9oz) each, for the face(Make 10dough balls). 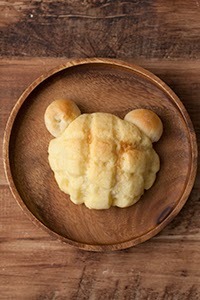 ⑤Lightly flatten the bread dough and punch it down. Re-roll all of them. ⑥Take the cookie dough out of the refrigerator. 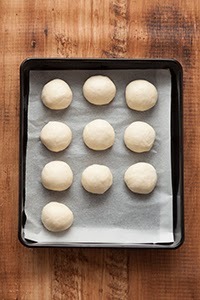 Take one more sheet of plastic wrap and place it on top, then stretch out the dough with a rolling pin (to a size slightly bigger than the rounded bread dough,) put on top of the bread dough and wrap it around it. 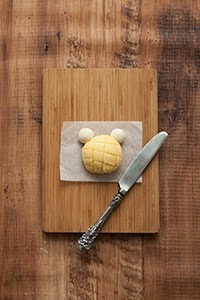 Make cuts in a square shape with a knife and place on top of a baking tray lined with a baking sheet. 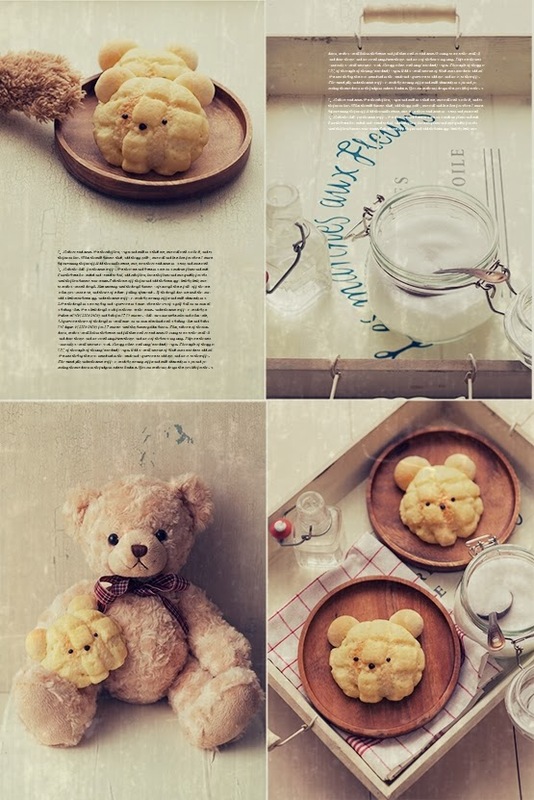 Finally, paste the small bread dough for the ears to complete the shape of the bear. 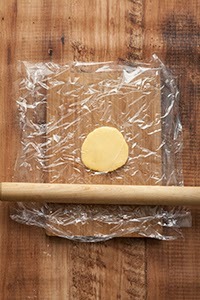 To prevent the dough from drying up, place plastic wrap and a fully wrung wet cloth on top. Make sure the plastic wrap does not stick to the dough. 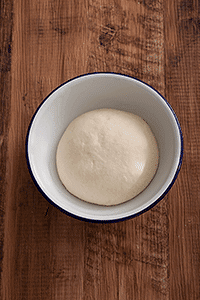 ⑦Do the secondary fermenting until the dough blows up to twice its size. Pre-heat at 170℃(340F) and bake for 18～19 minutes . let it cool on a cooling rack baked bread.